Everybody who's ever been funny is in it! Brilliantly simple, the plot concerns a caravan of motorists who witness a terrible accident on a dangerously windy California highway. The auto-crash victim (Jimmy Durante) reveals in his dying words that he has hidden a fortune of stolen cash, sending the drivers on a rambunctious race to see who can claim the loot first! After years of serious dramas like Guess Who’s Coming to Dinner and Judgment at Nuremberg, Stanley Kramer went wacky with 1963’s rollicking comedy It’s a Mad, Mad, Mad, Mad World. This star-studded affair follows a treasure hunt. After an old man named Smiler Grogan (Jimmy Durante) crashes his car, he tells the strangers who attempt to help him about $350,000 hidden in a state park. After some trickery, the guys (Mickey Rooney, Buddy Hackett, Sid Caesar, Jonathan Winters and Milton Berle) attempt to discuss the situation rationally and come up with a plan fair for all. Greed gets the best of them, though, so they adopt an “every man for himself” mindset. We follow their attempts to retrieve the money, law enforcement surveillance, and many, many story complications. If you want a film packed with subtlety, World isn’t the place to go. It quickly sets its tone when Smiler dies and literally kicks a bucket. World doesn’t present plenty of cheap gags like that, and when it uses them, it does so in a winking way that makes them amusing and not insufferable. Nonetheless, a viewer must understand the kind of comedy on display here; this isn’t going to be a low-key piece. It comes packed with slapstick and broad overacting. Neither harms the flick, since they embrace the spirit of the story. It wants to give us a wild ride packed with wacky shenanigans. Does it care if any of it makes sense? Of course not – that’s not the point. The film intends to entertain the audience with a non-stop romp. In that spirit, World packs probably the most astonishing cast ever assembled in one place. The names listed in my synopsis would be enough to create a good group, but they’re literally just the tip of the iceberg. One star after another pops up here; we find so many notables that if I listed them all, this would immediately become my longest-ever review. Some of them don’t pack much of a punch for modern audiences, but we find more than enough famous folks to fill out 10 movies. To my amazement, the cast works. I worried that Mad would offer nothing more than an unending parade of cameos with no real purpose. Some of that does happen, but most of the big names serve the film well. I don’t see many examples of famous folks here just for the sake of their notoriety. Is Mad the funniest movie I’ve ever seen? No – not by a long shot, actually. It can be hit or miss, and with a running time that edges toward three hours, it’s probably too long. However, it moves at a good pace and fills out that length well. This becomes a consistently fun, clever romp. 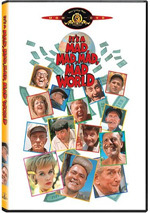 It’s a Mad, Mad, Mad, Mad World appears in an aspect ratio of approximately 2.55:1 on this single-sided, double-layered DVD; the image has been enhanced for 16X9 televisions. Although the transfer occasionally showed its age, it usually looked quite good. As one would expect from a 45-year-old flick, source flaws created the majority of the image’s distractions. I noticed sporadic instances of specks, blotches, marks and blemishes. However, these weren’t dominant. The film could use a good cleaning, but the defects didn’t overwhelm the presentation. Sharpness was solid. I noticed some light edge haloes at times, but the flick remained concise and well-defined. Even with its super-broad aspect ratio and many wide shots, the picture showed consistently good definition. No issues with jagged edges or moiré effects arose. Colors usually did well. The picture took on a slightly brownish tint that made skintones a bit too tan, but the hues usually appeared natural and vivid. I thought they were strong most of the time. Blacks seemed dark and dense, while shadows showed nice clarity and delineation. The print flaws were the main reason I gave the transfer a “B”, but I felt fairly satisfied with it. As for the Dolby Digital 5.1 soundtrack of World, it held up very well after all these years. The forward soundfield offered a very broad setting for the action. Lots of localized speech appeared, and the dialogue was well-placed. Effects also demonstrated good breadth, as those elements popped up in the correct spots and blended together well. Music featured positive stereo imaging. Surround usage was limited. On a few occasions, I heard vehicles from the rear, but I didn’t notice anything else back there. The surrounds may have reinforced the forward material, but they didn’t do much else. Nonetheless, since the front channels worked so well, I didn’t mind the essential absence of surround information. Audio quality appeared good for its age. Speech was consistently concise and natural, with only a little edginess on a few rare occasions. Music offered nice life; the score was pretty bright and full. Effects could be a little rough at times, but not usually; those elements sounded reasonably full and tight most of the time. I really liked this track, as I thought it worked nicely for a 45-year-old flick. Unfortunately, this release of World includes no extras. The now-deleted original DVD from 2001 came with a documentary and about an hour’s worth of deleted scenes, but this edition drops them. It comes with nothing at all. It’s a Mad, Mad, Mad, Mad World boasts an astonishing cast and actually manages to use them well. Though the wacky romp sputters on occasion, it usually delights and amuses. The DVD provides above average picture and audio, but it comes with no extras. This is a fun ride.